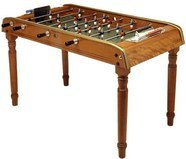 The B60 standard is the coin-operated version that Bonzini makes in order to place their foosball tables in bars and pool halls across the world. The coin-operated versions are more expensive because they have additional parts to dispense the balls, collect the money and a security mechanism that requires keys to open. The B60 table cabinet is split in half so you can lift it on the hinges to collect the money and replace and repair the additional mechanical parts inside. 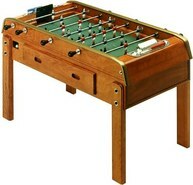 Besides these differences, the B60 standard is practically the same table as the B90 foosball table home edition. 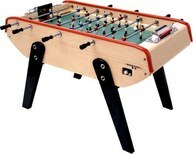 This table is a European style that uses pin shots and ball control instead of the sheer speed of American style foosball tables like Tornado. 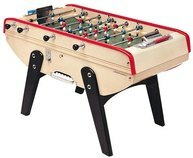 This is an extremely sturdy foosball table with high-grade and hand polished aluminum foosball rods, goals, and men, and other perfectly machined foosball parts that set the B60 Bonzini foosball table apart from other brands. This table comes with your choice of cork or plastic foosball balls, but we recommend the cork version as these are tackier and allow you to be more effective with pin shots. 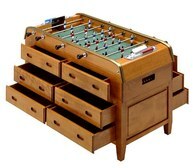 Visit Bonzini USA for a list of dealers to determine pricing in your area.